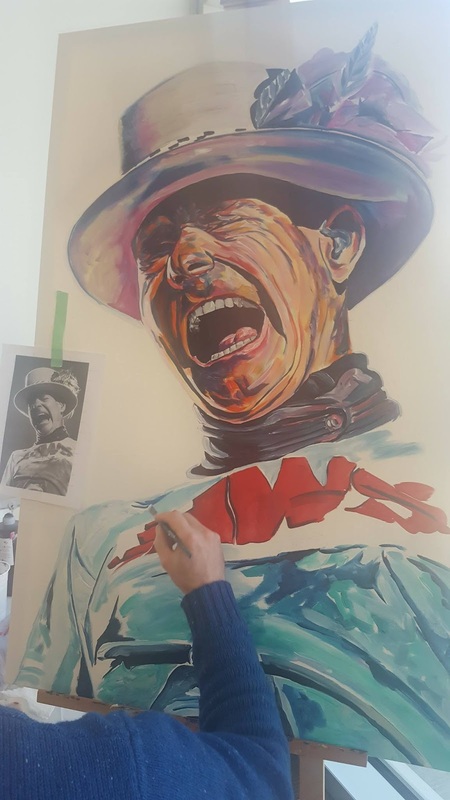 A few days ago, Colin Hartigan asked if I would consider doing a portrait of Gord Downie as a fundraiser for our local United Way campaign. Colin is a big fan, and a big community champion, serving as our Community Campaign Chair. He wears his heart on his sleeve about his love for Fort McMurray, in many different ways, and he has gone above and beyond with this campaign. Colin understands the need in a deeply authentic way and he is doing everything he can to gather as many resources as possible. I was honoured to say yes to his request. 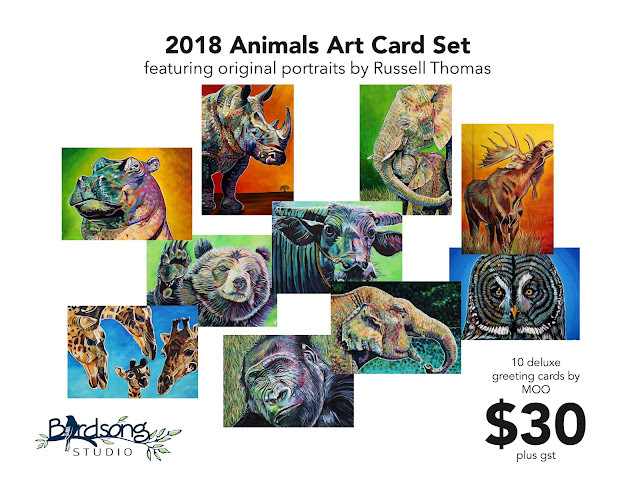 To be honest, my personal calendar is packed, doing commissions, other pre-scheduled charity paintings, and getting ready for my first solo exhibition. So, I checked in with my boss to see if she'd let me use a bit of work time to make this happen. 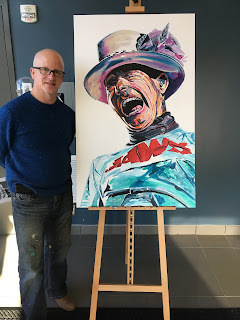 That is why I began my Friday, painting a 30" x 48" portrait of Gord in The Redpoll Centre hallway. It is a rather complex composition, and took until 9 am to completely sketch out. 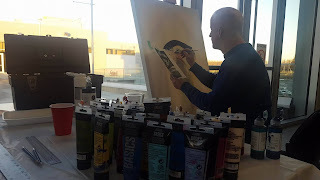 I started applying colour shortly thereafter and wrapped up the first phase of painting right around noon. 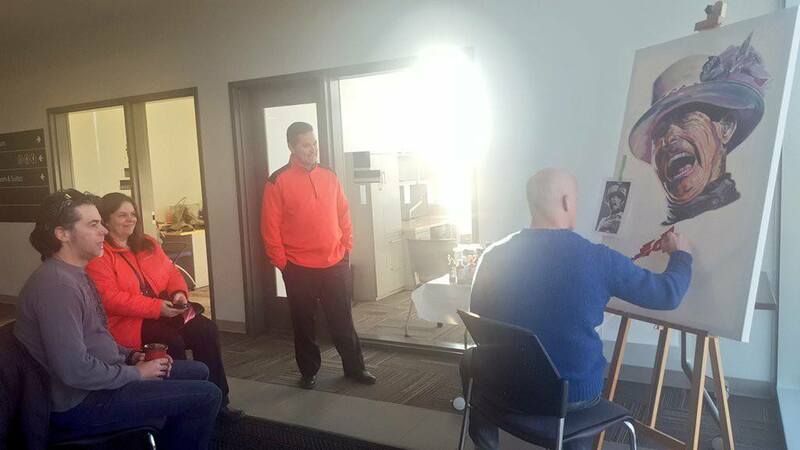 I was delighted by the various people who dropped by to visit and watch, particularly Greg and Carla. They are visiting from Newfoundland and are huge Gord Downie fans. Someone had mentioned what I would be doing the night before and they decided to pop by for a visit. While I would have loved to complete the project in one morning, it was not to be. I went home, had my requisite nap after lunch, and did a bunch of running around I needed to do for my art show before returning to the painting in the studio. I did a base coat of the background, pulling in purple and magenta. On the second pass I brought in more blues with white highlights. 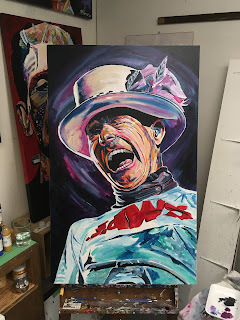 The energy of the piece started to feel right at this point. A couple of hours of touch ups in the evening brought "Resilience and Courage" to conclusion. 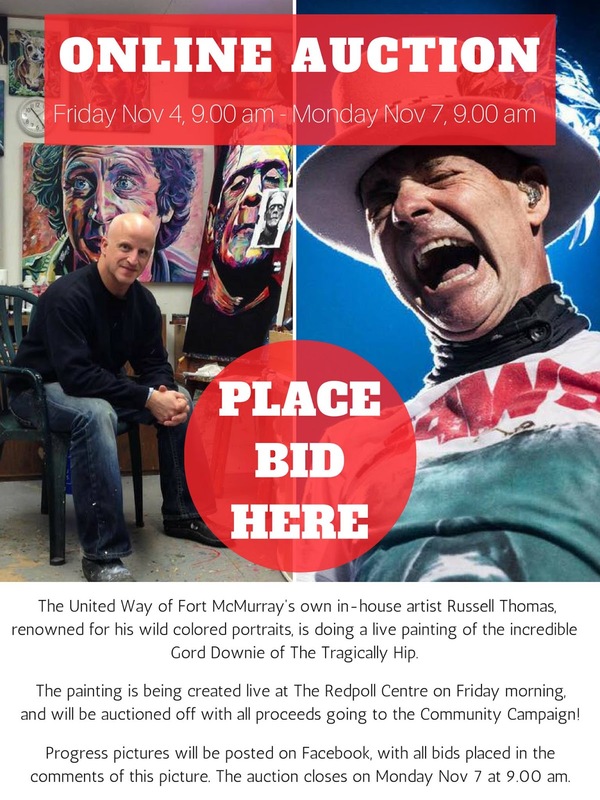 The painting is being auctioned on The United Way of Fort McMurray Facebook page. 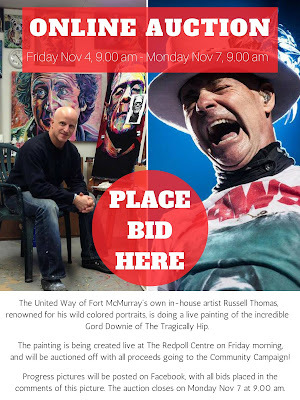 Look for the album: Online Auction: Russell paints Gord Downie. 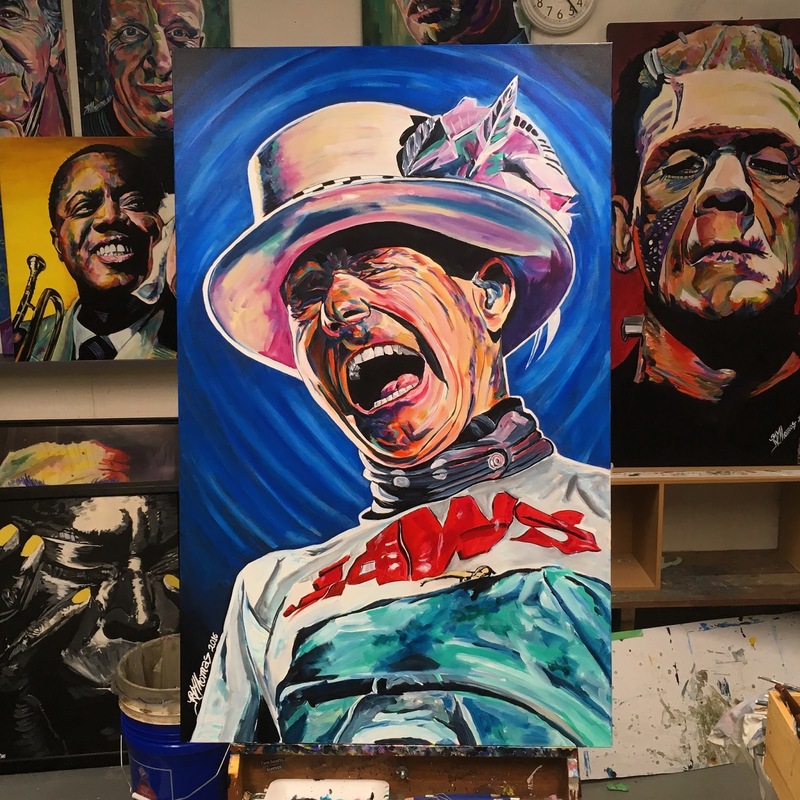 Bids are being accepted until 9 am on Monday, November 7th. All proceeds will support agencies, programs and initiatives that help children, youth, disadvantaged adults, families, and seniors in Wood Buffalo. Crista Watts Baker kicked off the bidding at $300, Dale Unruh bumped it up to $2,000, followed by generous bids by Paul Hartigan and Liam Burgess. An anonymous bidder has taken it up to $6,000. I'm proud of this painting and how it turned out. 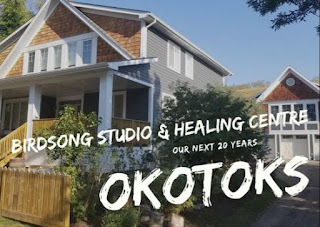 It is fantastic that it will help our community. I'm in awe of Gord Downie and his resilience and courage. 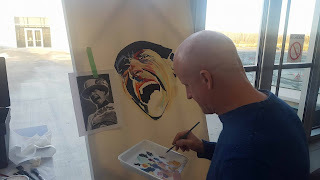 I'm in awe of another friend in our community who has the same cancer for similar reasons. Both are subjects that I have been honoured to paint.